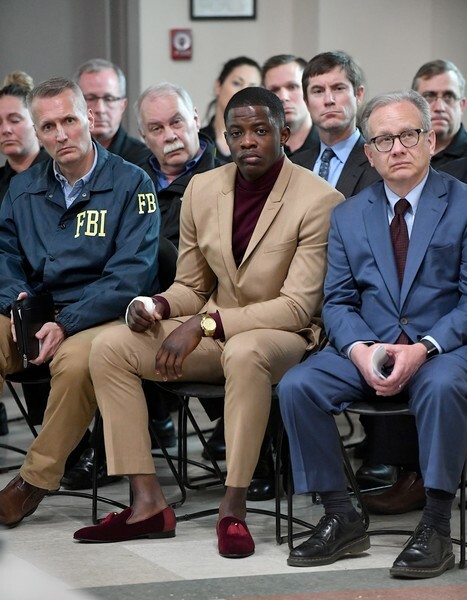 Waffle House patron James Shaw, Jr. (C) who stopped the shooting at a Waffle House where a gunman opened fire killing four and injuring two attends a press conference with FBI Special Agent In Charge, Matthew Espenshade (L) and Metro Nashville Mayor David Briley (right) on April 22, 2018 in Nashville, Tennessee. Shaw, Jr., 29, took action disarming the gunman and ultimately forcing him out of the Waffle House restaurant. Travis Reinking, 29, of Morton, IL, is person of interest in the shooting and is suspected to have left the scene naked.